The famous Dividend Aristocrats are a select group of S&P 500 stocks with 25+ years of consecutive dividend increases.These are all large US companies since they are part of the S&P 500 Index. Although quarterly dividend pay-outs and yearly consecutive dividend increases are not common in Europe, there is a list of European Dividend aristocrats. The European Dividend Aristocrats are based (by S&P) on the 40 highest dividend-yielding Eurozone companies within the S&P Europe Broad Market Index (BMI) and a managed dividends policy of increasing or stable dividends for at least 10 consecutive years. 40 highest dividend-yielding (EU), in the US the height of the yield is not a selection factor. The Dividend European Aristocrats Excel spreadsheet contains the following fundamental and stock price performance metric for each stock in the index . As explained the European Dividend Aristocrats Index currently contains 40 stocks . 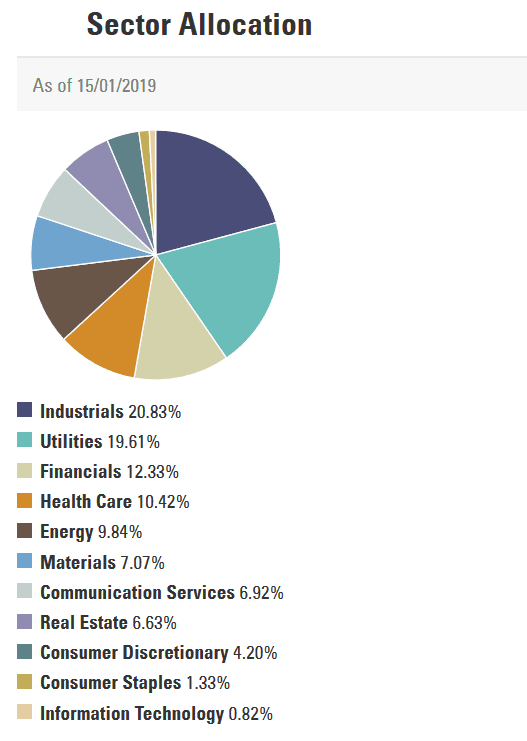 As you can see below, the Industrials sector accounts for 20.8% of the index. Information Technology is on the other end of the spectrum at less than 1% of European Dividend Aristocrats Index. To compare, the largest US dividend aristocrats sector is Consumer staples.